It’s quite possible that a lot of you have made it through life without knowing what a Sunseeker Predator 82 is, and that’s quite alright, we won’t judge you – before we were invited to spend the day on one our knowledge was limited too. But now, having passed eight glorious hours on this streamlined beast of the waves, it’s etched into our memories forever. You know why? Because this is a super yacht that’s so snazzy it’ll have you salting its deck with your own tears, that’s why. 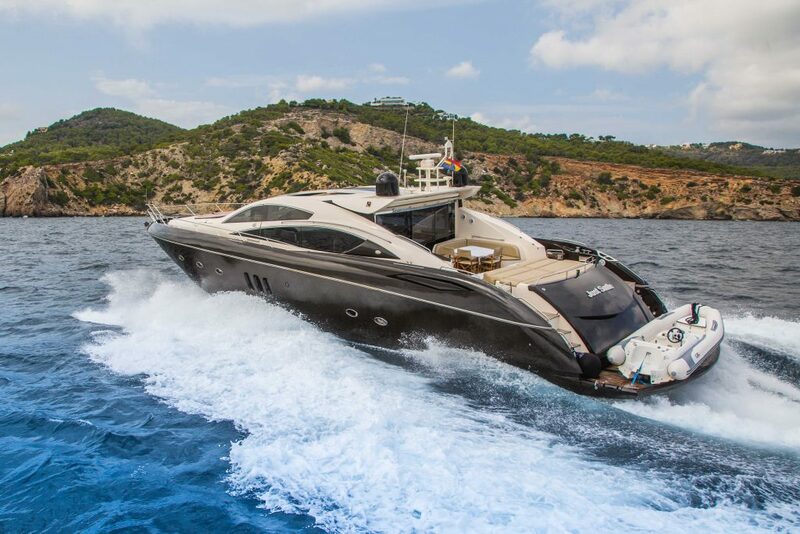 So if you read this and then don’t immediately sign yourself up for a day at sea, that’s when we’ll judge you, because trust us when we say no trip to the White Isle is complete without a sun-soaked session aboard the Sunseeker. It’s actually quite difficult to prepare you for the magnitude of the Sunseeker – sure, you can admire the pictures, but when you actually see it close up it’s kind of mind-blowing. 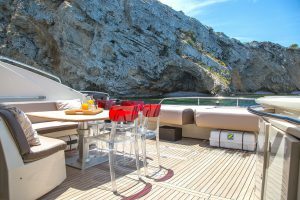 The sheer size of it, for a start – it’s 24m long, boasts four ensuite rooms and a lounge below deck and an al fresco dining table up top, has comfy sun beds at the front and back, and accommodates to 12 people and three crew. Then there are the varnished wood floors and the sleek fittings and the general sense of luxury that oozes from every surface – this is a super yacht that’s been designed to impress, and that’s precisely what it does. 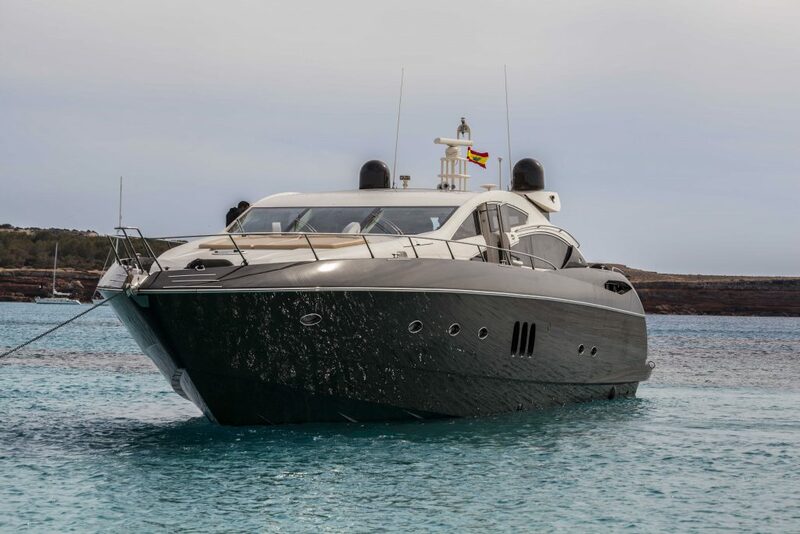 If you hire this bad b oy, you’ll be picked up from the port in Ibiza Town in the morning (or at a time of your choice) and whisked across the turquoise waters to Ibiza’s unbelievably picture perfect sister island, Formentera. There, you’ll spend the day floating atop the Med in a state of blissful relaxation, with complementary drinks and snacks only steps away. So recline on the luxury sunbeds, soak up the rays or sip on a cocktail. There’s a fully equipped kitchen on board so you can rustle up your own snack or let us know and we’ll have catering of your choice organised on your behalf. Thrill seekers will want to rev up the tempo with some watersports action, and thankfully the yacht’s garage is stocked full of adult toys begging to be played with. Snorkels and paddleboards are included in the hire, but if you really want to step up with the big guns, you’d do well to hire the additional extras. Take your pick from kayaks, jet skis, and in our opinion, the jewel in the watersports crown – the spectacular seabob. These motorised machines guide you under the water with more grace than a dolphin, in turn providing more fun than should be acceptable once you’ve left primary school. How you spend the rest of the afternoon is then up to you. Crank the music while you explore some of the islands’ stunning coastline, look for sea creatures frolicking in the waves, or let us know in advance and you can still be at sea to watch the famously glorious Balearic sunset. Whatever happens, we promise you’ll have spent a day at sea that you’ll never forget, and that’s what holidays were made for. Book your day on the Sunseeker Predator 82 here.